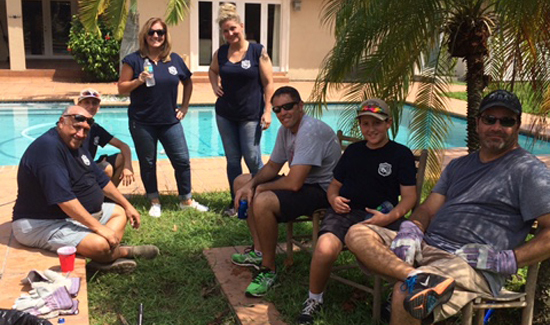 The Dade County PBA team relaxing after hours of grueling work cleaning up the property of the mother of Roger Castillo, who was killed in the line of duty in 2011. The clean-up from the devastation wrought by Hurricane Irma is underway. Millions of people are without power and may not be back online a week and maybe longer. Twenty-one thousand electrical repair people are on the ground. Six people died in a nursing home when the power went out. It will take months to assess the true damage caused by Irma, the most powerful hurricane in U.S. history. Pablo Sanmiguel’s property before the Dade County PBA team went to work. Once the officers did everything they could to help the citizens, they turned their attention to the home of the mother of Detective Roger Castillo, who along with Amanda Haworth, was shot and killed while serving a felony warrant on a man wanted for murder in 2011. The detectives, along with two other members of a regional task force, had gone to a home. Upon making contact with an occupant of the home, someone inside immediately opened fire, striking Detectives Castillo and Detective Haworth. Another detective on the scene returned fire and killed the suspect. Mrs. Castillo’s home was totally buried in debris. 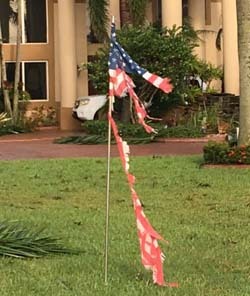 Irma’s powerful winds tore this flag to shreds. 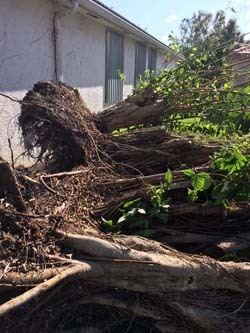 One Dade County PBA member, whose home was destroyed, returned home after a very long shift at 3 am and found that his fellow officers had taken chain saws and cleaned up most of the mess.